Inspiration is a funny thing. It's completely individual, we can all look at the same object or person or vista and see or feel something completely different than the person next to us. I love to see what inspires people. I love that artists and designers can see something bigger, a different purpose in everyday items. Elizabeth Yarborough, a North Carolina native and NYC transplant, takes inspiration for her line of eclectic and whimsical jewelry from vintage finds and items with a sense of history and comfort. 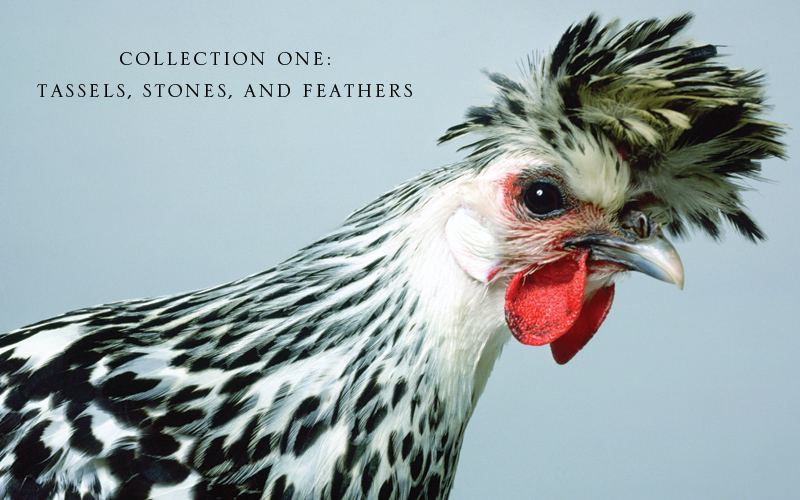 Vintage china, spools of thread, the plumes of a rooster, a warm cozy sweater-these are all things Elizabeth uses as both inspiration and material for her eponymous jewelry line Elizabeth Yarborough Jewelry as well as her fun and funky line of bangles, Yarbie Bangles. 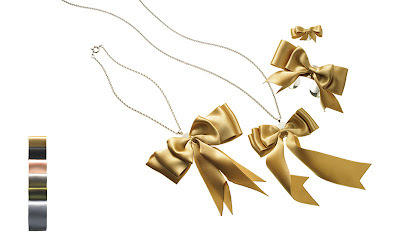 Elizabeth Yarborough Jewelry ranges from feminine and romantic to subtle and understated. There are several collections within the line, each having a wildly different inspiration and for. There is a collection filled with chunky bits of chipped china (say that 3 times fast). One of my favorites is an almost masculine series of leather button pieces; they're subtle and understated but confident. A flirty, feminine, VERY Southern collection features simple satin bows. 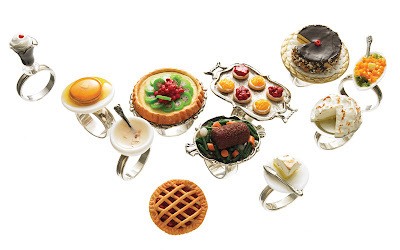 Elizabeth's sense of humor shines through with her Finger Foods series of sterling rings topped with tiny cakes and pastries; they're adorable and such conversation pieces. An almost separate element to Elizabeth's line is Yarbie Bangles, a line of bangle bracelets in a variety of sizes and materials. I'm in love with them. I just want to stack up piles of them and use them as decoration! 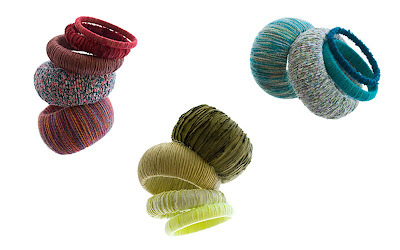 She uses a range of materials to create her bangles, there are cashmere, silk, cottons, wools, even what looks like old calico fabric. They're fine individually but look fantastic mixed and matched and stacked up your arm. 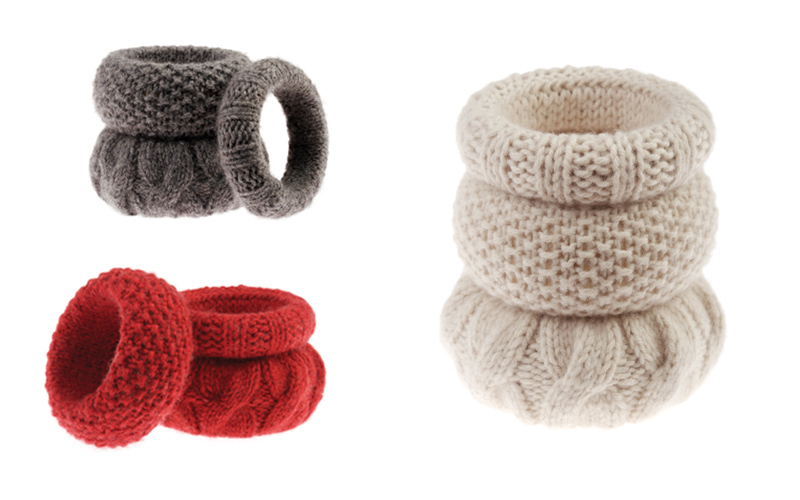 I particularly love the ones based on a snuggly cable-knit sweater. 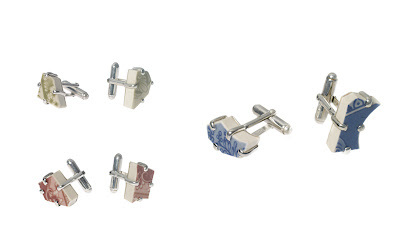 Altogether a really fun, creative, and fresh jewelry collection. 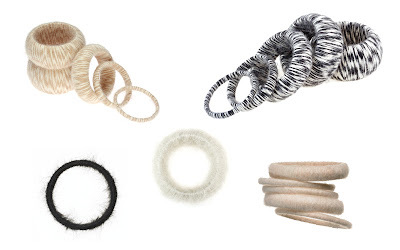 Yarbie Bangles can be purchased through their online store. Elizabeth has even opened her first standalone storefront in fabulous San Fransisco. 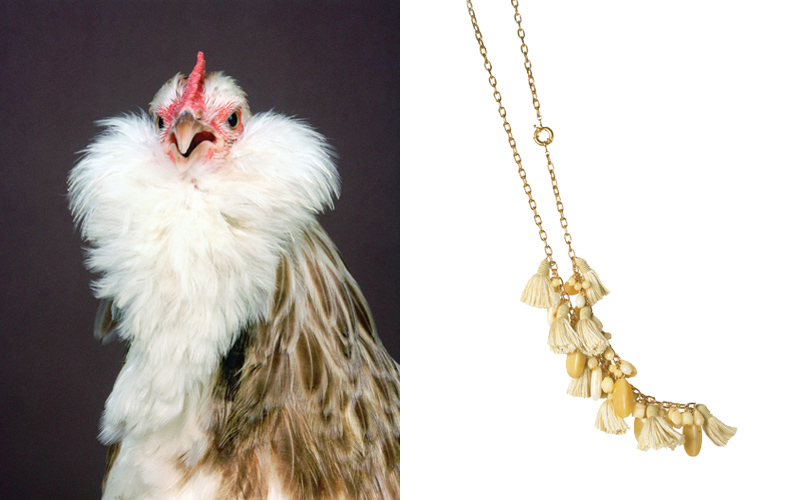 With her uniquely creative eye and fresh vision, Elizabeth Yarborough Jewelry is a noteworthy addition to any wardrobe. VERY Different! I like the rooster pic! This is great. Can't wait to make one. I hope to have a collection as amazing as yours one day!